We are so excited! 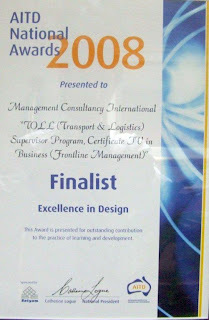 We have been acknowledged by the training industry for excellence for the supervisory program that we designed and delivered for Toll. We have won the Training Australia magazine award for a Frontline Management program and we were finalists in the AITD award for Excellence in Design. The variety of media used in the program make it unique - we use videos of guest speakers from within Toll; there are off-the-shelf videos and we combine all of that with role plays, discussions and written work. Finally, the evidence required by the Frontline Management Certificate 4 is collated into the MCI Portfolio Builder which ensures that evidence is presented in a straightforward and user-friendly way.